I'm taking a couple of weeks of leave and in that time the plan is to complete the paving of a path to the back compost bin and also clean out the garage (and house!) so that we can park two cars in the garage. 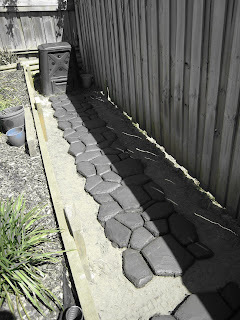 Check out the before and WIP photos of the paving... 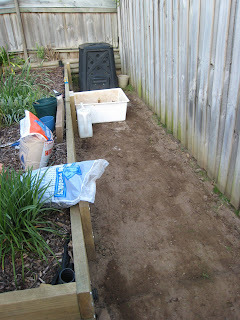 I started this morning at 6am and completed the paving/moulding part by 11.15am. Just the cementing in to go and then planting in the Pennyroyal :). Before, there is just some bare dirt and me trying to level it but still allow some 'fall' so that the drainage is away from our block. Also found a stray tomato plant peeking out of the compost bin, so as long as Will didn't stand on it when helping mould the pavers, we may actually get some Roma tomatoes this year. I assume it was from the Roma tomatoes from last season... although it could be any tomato we have eaten (or rather NOT eaten) since. The 'after' photo... or the 'WIP' Photo. Still need to cement it in and then it'll be done... barring the pennyroyal actually growing. Notice the drainage gap I've left? It's a pretty big gap but it made it an even 2 pavers on the shorter side.